“Spectre” took 750,000 working hours and is the third Benetti superyacht built for the Staluppis in less than ten years. The result is spectacular as its name. Many challenges had to be faced, among which was to find the perfect balance between sporty allure, high performance and great comfort. 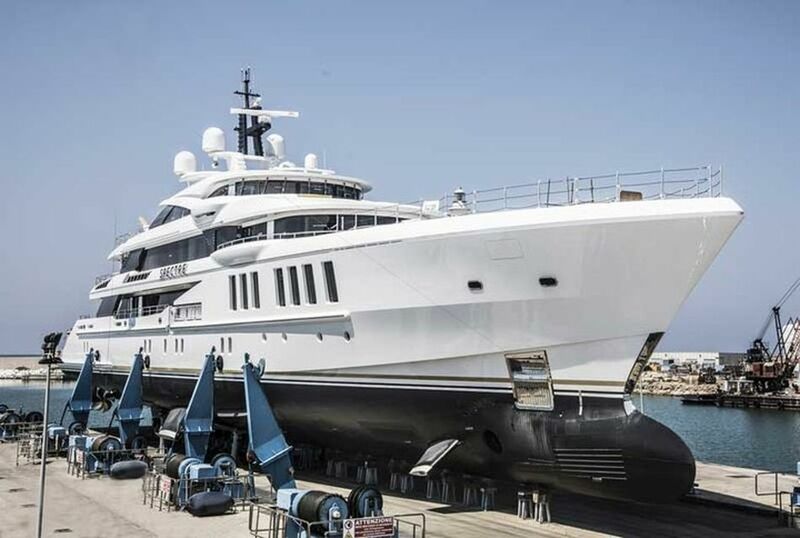 “Spectre” aims to deliver an extraordinary performance for a yacht of her size. The exteriors lines were designed by Giorgio M. Cassetta, hull lines and naval architecture were done by Mulder Design. 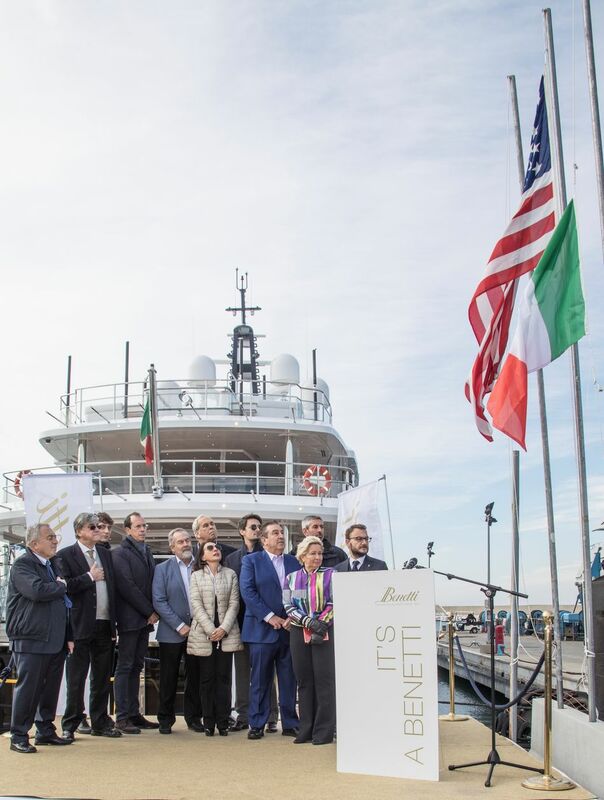 Benetti has delivered M/Y “Spectre”, on 19 of November, to John and Jeanette Staluppi, experienced owners who adore James Bond filmography, 50s and 60s sports car adrenaline excitement, and the Made in Italy ethos. The strongly sporty appearance was achieved by the volume and proportion fluidity. All of which contribute to making "Spectre" a yacht equal in performance to an aluminium yachts. The contribution and support of the Dutch firm Mulder Design, which was responsible for the structural design, the hull and the propulsion system, was hugely important in this achievement. Due to many clever measures the weight of the yacht has been reduced considerably. The performance, of what Frank Mulder, founder of the eponymous studio, has baptized as the "High Speed Cruising Hull", is incredible. The maximum speed is 21.2 knots, 30% higher than a traditional displacement hull and the autonomy is equal to 6,500 nautical miles at the considerable speed of 12 knots. "Spectre" also features Naiad Dynamics Total Ride Control® technology , installed for the first time on a yacht of this type. Originally developed by Naiad for commercial and naval ships, thanks to the collaboration with Mulder Design, this technology was later configured to be installed on board “Spectre”. The active system ensures a significant increase in navigation stability and improved on-board comfort thanks to two roll stabilizing fins, two forward pitch control canards and three independently controlled stern interceptor blades. "We are proud to have participated in the creation of this spectacular 69-meter long motoryacht", said Frank Mulder, recalling how "Spectre" is the ninth project of the Staluppi’s with Mulder Design. 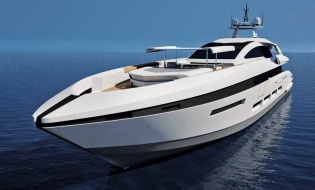 "Her High Speed Cruising Hull will not only be approximately 30% faster than “normal” displacement yachts with similar power but will also reduce fuel consumption at long range speed. The ground-breaking use of Total Ride Control®, which is a combination of roll reduction and pitch reduction, will greatly improve comfort when cruising at 20 knots”. The words of the Dutch engineer echo those of Giorgio M. Cassetta, who commented: "I love ‘Spectre’: it is a perfect example of a virtuous synthesis between the owners' and the builder's cultures. John and Jeanette Staluppi, with their great experience and energy, have led us to imagine a yacht complete with everything you could wish for boats of this size. Benetti has taken up the challenge and has created a yacht with many technological innovations respecting the highest quality standards". The Lower Deck houses a fixed platform, separated from the beach club by a sliding glass door, the large garage (that can accommodate an over 9-meter tender, plus a second support boat of 7.5 meters and two jetskis) and the engine room. Between this area and the two guest cabins a full-beam spa area includes a gym, hammam and massage room (convertible into a cabin). Finally, on this same deck, there is the area dedicated to the 14-person crew. The Main Deck is characterized by a large external cockpit, a lounge with an entrance area with four wine cellars for the storage of fine wine, a living area and a large dining area, where – again – much space is dedicated to storage. The Main Deck layout is completed by two cabins with private bathroom and separate wardrobe area and, finally, a large VIP cabin with two bathrooms and two 90-square-meter wardrobes, which represent an alternative to the owner's cabin. The Upper Deck is dedicated to indulgence and relaxation: a stern external space of about 110 square meters is furnished with a 4-meter long dining table, a buffet and a social area divided into two symmetrical spaces. Moving past the salon, is the guest lobby and the owner's suite, which houses a private study and the actual cabin, with two separate bathrooms and two wardrobes. A unique feature, requested by the owners, is the external access to the bow area, where two side terraces have been designed. The Bridge Deck is entirely dedicated to relaxation, equipped with a custom swimming pool, two sunpads, bar and a central lounge area with a modular design (its configuration can be changed according to needs). There is also a more informal dining area, for al fresco dinners, served by two large buffets complete with grill and pizza oven. M/Y "Spectre" is, therefore, a yacht that does not go unnoticed for its original concept, she will become a new symbol of Made in Italy in the world.